The McGraw Center for Business Journalism at the City University of New York’s Graduate School of Journalism offers a fellowship program to support in-depth coverage of business and the global economy. The fellowship provides editorial and financial support to journalists who need the time and resources to tackle complex, time-consuming stories. The McGraw Fellowship provides editorial and financial support to journalists who need the time and resources to produce a significant story or series that provides fresh insight into an important business or economic topic. We accept applications for in-depth text, video or audio pieces, and we encourage proposals that take advantage of more than one storytelling form to create a multimedia package. Typically, we’ll award grants up to $5,000 a month for one to three months; in exceptional cases, we’ll consider longer grants based upon specific proposals. We’ll look for applicants with a proven ability to report and execute a complex project in their proposed medium; ideally, candidates will also have a strong background or reporting expertise on the subject of their piece. The McGraw Center provides editorial supervision during the Fellowship. We work with the Fellows to develop their projects during the reporting phase and frequently edit the completed stories. We also assist with placing the articles. In some cases, we partner with established print, radio or digital outlets; in others we will publish them as e-books or through the CUNY J-School’s book imprint. The stories also run on the McGraw Center website. The aim of the McGraw Fellowship for Business Journalism is to support in-depth, ambitious coverage of critical issues related to the global economy and business. In an age when many news organizations no longer have the resources to tackle complex, time-consuming stories, the Fellowships enable experienced journalists to do the deep reporting needed to produce a serious piece of investigative or enterprise journalism. 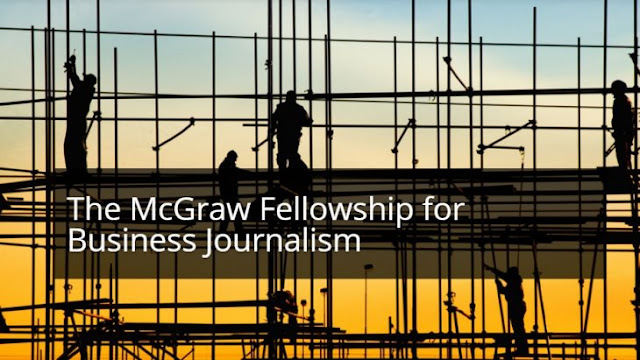 The McGraw Fellowship for Business Journalism is open to anyone with at least five years professional experience in journalism. Freelance journalists, as well as reporters and editors currently working at a news organization, may apply. Applicants should submit a well-focused story proposal of no more than three pages through the accompanying online form. Think of it as pitch, much like you would submit to an editor at a newspaper, magazine, digital outlet, or radio station: give us enough preliminary reporting and documentation to demonstrate that the story is solid. The proposal should highlight what’s new and significant about the story, why it matters and what its potential impact might be. The proposal should also note where significant stories on the subject have run elsewhere and how the proposed piece would differ. Applicants should also briefly outline a proposed reporting plan and a timeline for completing the story, and let us know if a media outlet is lined up to run the story. In addition, applicants should enclose three journalism samples. The samples should be professionally published work that showcases your ability to tackle an in-depth story in the proposed medium. Please also provide us with a resume and references from two editors or others familiar with your work; if that is a problem, please contact us to discuss alternatives. No budget is required at the time of application, but finalists may be asked to provide an estimated budget or further information on their project at that time. The McGraw Center for Business Journalism.